Firemen look on, controlling the burn area, while a structure they have used for training for the past two months is burnt to the ground, making room for new development. On March 21 the Mountain Home Fire Department did the opposite of what they usually do. They burned down a house instead of saving it. The old house was an acquired structure that had been donated to them by a member of the community who desires to develop the property. When the house was first donated to the department, only the officers knew they had acquired it. 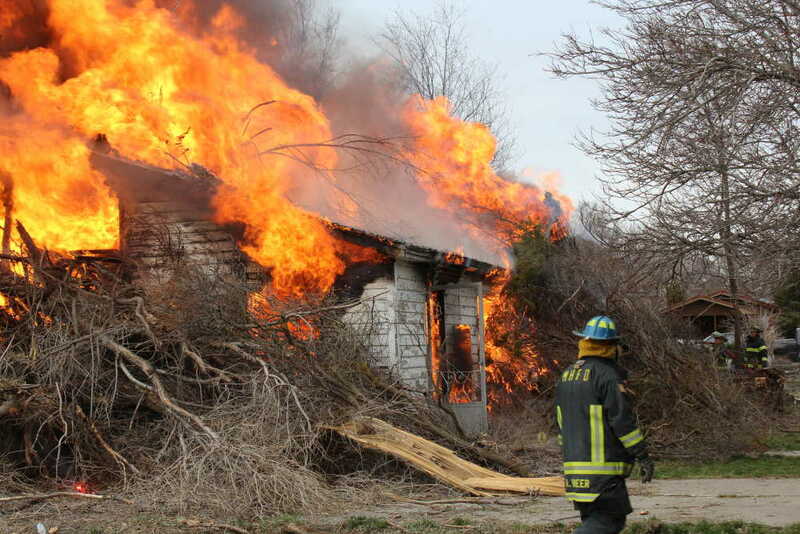 During a routine training one evening, Chief Moore and another fireman snuck over to the house on South 14 East and set the back side of it ablaze. Once the fire got going they had dispatch put a call through over the radio and hid waiting to see their firemen's response to the flames. The fire department had been training in the structure for a couple of months before finally burning it to the ground. According to Fire Chief Mark Moore receiving structures to train for real life scenarios in is very important to the volunteer fire department. MHPD has a training facility, but nothing compares to honing their skills on a real structure with something as unpredictable as fire. To check out more photos from the fire training go to our photo gallery!